Since 1931, mankind has tried to reach the upper stratosphere that surrounds the Earth using a variety of methods. Of these attempts, many of them resulted in unconsciousness, injury or death. In 2012, Austrian skydiving daredevil, Felix Baumgartner, set a world-record when he jumped from a helium balloon 24 miles above the planet, reaching a top speed of 843.6 mph, becoming the first person to break the sound barrier without assistance from a powered vehicle. Think on that. 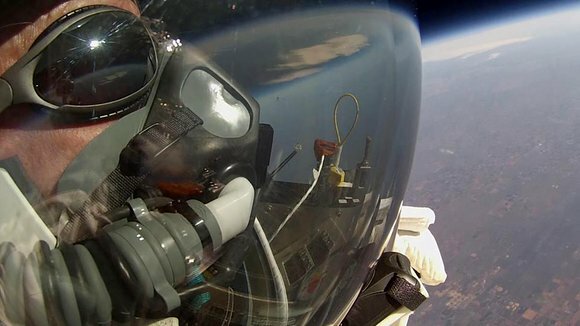 On October 24th, 2014, Alan Eustace, an American computer scientist, free-fall jumped 25.74 miles without a parachute and the documentary “14 Minutes from Earth” covers his bold mission to promote science and space-exploration. What inspires such a bold and harrowing feat? Well, it could be (as this film describes) because the stratosphere is one of the least explored realms on Earth. We know more about our oceans and deep space than we do this thin layer of gas that protects us from solar radiation. If we learn more about the stratosphere, we could learn more about weather patterns, natural disasters and climate change. In order to do so though, a safe way to explore this atmosphere is needed. So, how does Eustace, a 57-year-old computer scientist/engineer and Senior Vice President of Knoweldge at Google, qualify to be the guy to complete such a daring attempt? Here’s a guy who can create search engines and map programs, a sit/stand work station, biking-to-work kind of guy, who also has a skydiving hobby. 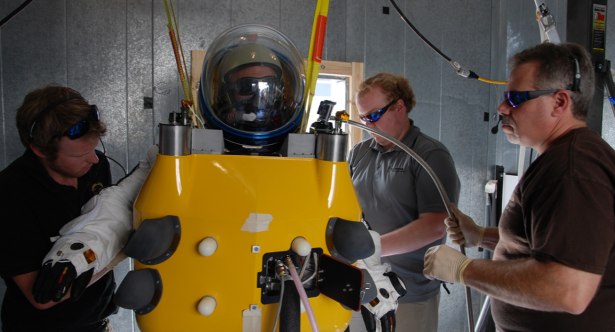 Well, he felt that since man can handle the pressures of deep sea scuba-diving then there could be a possibility to create a suit that can handle the unique pressures of the stratosphere, one that would lift him higher than Mt. Everest. Of course, Eustace would have to consider the oxygen, atmospheric pressure and body temperature of the suit, because staying alive would be the best way to experience this venture. “I just think it’s a nice, simple approach, “states Eustace, about the spacesuit he designed on a napkin, “to a really really hard problem”. Wait a minute….a napkin drawing? That’s right, Eustace drew a space suit on a napkin and ran with it, believing his concept could be created and utilized to accomplish something that’s never been done before. It’s hard to believe, but what Eustace set out to do is similar to other landmark explorations of the past, like the Apollo space program. Only in this case, it would just be a single man who floats up into the stratosphere in a special suit that’s being pulled up by a specially-designed balloon (that’s going to inflate to the size of a football field) and then, at just the right time, disconnect and descend back to Earth at up to 100 mph. That’s sounds crazy, but with the support and understanding of his wife and kids and a talented and knowledgeable crew and resources, Eustace accomplished this amazing fear – otherwise, why else make a film about it? 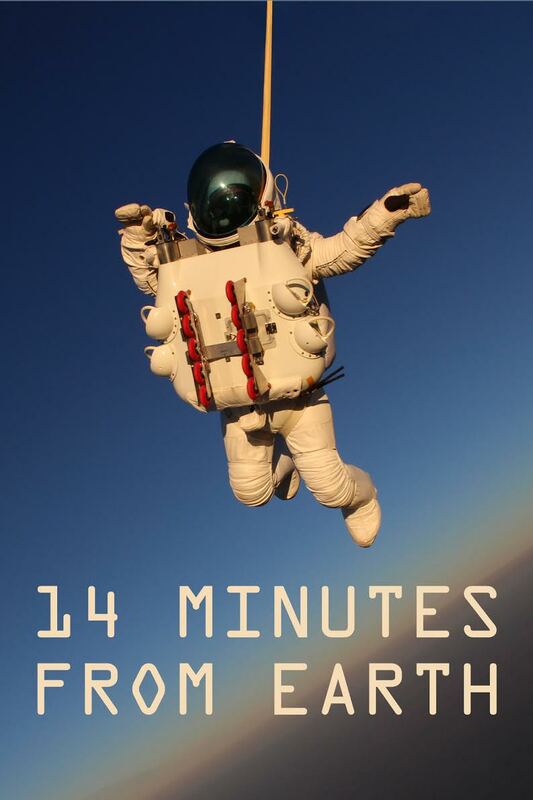 “14 Minutes from Earth” is directed by four guys – Adam ‘Tex’ Davis, Jerry Kolber, Trey Nelson & Erich Sturm – which is understandable considering where all the coverage involved in capturing the incredible journey of Eustace and company. Adam is a director, producer (“Brain Games”) and screenwriter (remember “Just Friends” with Ryan Reynolds) and co-founded Atomic Entertainment, the studio behind this doc. Erich is an award-winning writer/director and current showrunner of the crime series “Homicide Hunter”. Trey is a director whose credits include “Lost in the Sun” and the National Geographic Explorer Series. Jerry has produced hundreds of hours of factual television, including multiple National Geographic series. The quartet inject an assortment of talking heads throughout their documentary, from colleagues t0 a variety of engineers that tirelessly on this project. Several Google co-workers share their thoughts on Eustace and his goal, such as Executive Chairman, Eric Schmidt and Rachel Whetstone, Senior VP of Communications and Public Policy, Urst Holzle, Senior VP of Technical Infrastructure, Urst Holzle and Senior VP of Engineering, Amit Singhal, who shared that Eustace believes in the Google motto, “we have a health disregard for the impossible, because that’s what changes the world.” Alan’s wife, Kathy Kwan, also talks about her husband’s drive and although she supports his passions and what makes him happy, she knew full well that if anything were to happen to him, it would drastically change their family forever. To go from napkin sketch to an actual suit that Eustace could wear, he had to seek out a team who would help him design and create it. He found the co-founders of Paragon Space Development – Grant Anderson, Jane Pointer and Taber MacCallum – willing to join forces with him on this journey. Paragon is a premier provider of life support systems and thermal control products for extreme environments, whose clients include NASA, major aerospace companies, and the United States Military. Once they realized that Eustace was a knowledgeable engineer in his own right, who’s been skydiving since he was 17 and completed 572 jumps, they knew he was the real deal and the right man to take a risk with. They needed others to join them if this suit was to be designed, a company that would actually build the pressure suit – and considering there hasn’t been a new space suit designed in almost 40 years, that would be quite a task. They found ILC Dover, an American special engineering development and manufacturing company that would work with Paragon and Eustace to create the suit. Of course, none of that would mean anything if they didn’t have a reliable parachute to provide a safe landing. Eustace found parachute engineer, Daniel “Bilkkies” Blignaut, with United Parachute Technologies. What would prevent Eustace from experiencing the near-fatal spins that Baumgartner did during his descent? A drogue. A what? A drogue parachute is one that provides the ability to slow a descending object, while providing the ability to control and stabilize while in the air. The parachute is subjecting to a battery of tests, such as wind tunnel training at a testing facility in the Arizona desert, just as the suit is evaluated continuously, checking monitor boards, GPS, LED screens and making sure safety signals are reviewed and checked. Eustace undergoes a physical regiment as well and spends hours breathing oxygen to get the nitrogen out of his blood. 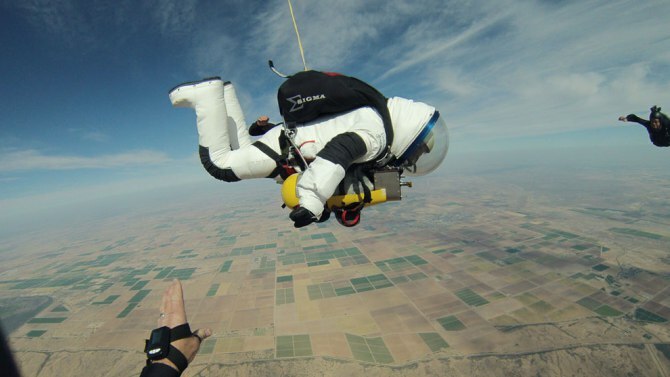 He and his crew of Paragon specialists like engineer Jared Leidich, flight director Sebastian Padilla and Stratex Launch manager John Strauss and others are involved in several test flights up to 15,000 feet, all to see if the suit (which weighs 200 lbs.) and the chute will hold up and to determine whether or not he can maintain control during his descent. As expected, problems arise and mistakes are made, but they only embolden Eustace, who shares, “trying to make progress always involves risk”, and his crew to work on how to make things more efficient, functional and most of all, safe – knowing full well that a man’s life is at stake. “14 Minutes from Earth” simply sets out to share with viewers what happened and what went into making it happen. Sure, there are setbacks, but absent is actually human drama. You get a little of that from Eustace’s wife, but almost all the talking heads are focused and provide info in a ‘matter-of-fact’ manner. The documentary zips along, focusing on the progression of the project with a narrator that stays on task. In many ways it feels like the kind of special you’d find on the Discovery Channel or a PBS special. If you’re already curious about space travel and watching science engineering nerds come together to make something awesome happen, then you’ll be invested throughout the entire documentary. When the final jump finally occurs, it is quite riveting and beautiful to behold. We’ve seen Sandra Bullock and George Clooney floating above the Earth in “Gravity”, but here’s a dude who usually sits behind a desk, who was determined to follow his dream and not be deterred. 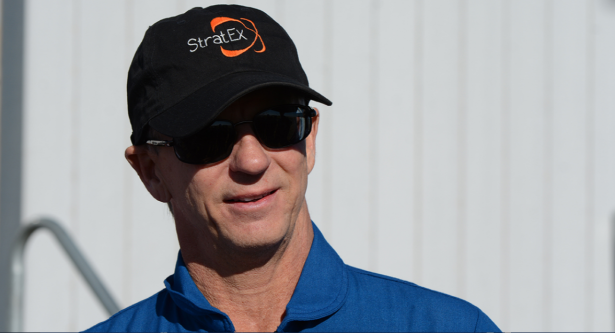 He’s still a Google executive, but now Alan Eustace is a stratospheric explorer.